In Winter 2019, we will be offering our seven week online course, Don’t Kvetch, Organize! Guided by experienced trainers and instructors, we will examine different ways that community organizing has been used to build a more just world for all and how our Jewish tradition and history inform our own commitments and approaches to acting for justice. We are particularly excited because this Winter, we will host our second cohort for Jews of Color in the course. This cohort will learn together how community organizing skills and frameworks can support their Jewish and justice work. The course also provides a platform to engage with other Jews of Color across the country who are working for social justice, while building relationships with each other through participating in the course together. 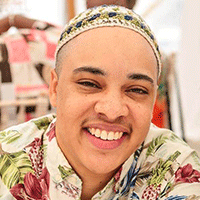 Yavilah McCoy: Yavilah McCoy is the founder of Ayecha, one of the first nonprofit Jewish organizations to provide Jewish Diversity education and advocacy for Jews of color in the United States, and is a consultant with her own Dimensions Consulting. Dove Kent: former Executive Director of Jews for Racial & Economic Justice (JFREJ) in New York. We are excited that Graie Hagans will be our course instructor this year. Graie is the National Organizer and Training Manager at Bend the Arc where he helps American Jews discover their own capacity to build a better and more beautiful world. He holds a MPP from Rutgers University and serves on the board of the Philadelphia Student Union and Jews in All Hues. He is a native of St. Louis and has a deep love for the midwest. Before joining Bend the Arc in June 2017, Graie was an interfaith organizer with the PICO National Network. He is a transmasculine Black Jewish G*d fearing justice lover. The section meetings… felt really empowering. I’ve never been in a JOC space before, let alone a JOC organizing space. My fellow cohort members are wonderful… I feel very grateful for this space! This was hugely helpful … and I’m very much looking forward to continuing this work into the future. I have learned to be patient with the long process, have small achievable goals along the way and make changes to the plan without letting my mistakes get me down. See more of what our past participants are saying here! A community of peers who also identify as Jews of color that share language and knowledge to support your work tackling issues you care about, even after the course! Coaching from JOIN Senior Organizers to support you in your organizing efforts. Run for seven weeks, including a vacation week in the middle of the course. The course will open on January 27, 2019 and run until March 17, 2019. Include a workload of about 3 hours of coursework total per week. You can see more information about the course syllabus here. The price of the course is $345. Regular registration for the course closes on December 17. We have a limited number of young adult (under 35) slots for $99 that you can register for on the regular registration form. Those who sign up for the course with a “buddy” are eligible for a $50 discount, so the course would cost $295. See our buddy page for more information. We make every effort to include participants for whom the course fee is a barrier. Please contact us if you are in need of a scholarship at dontkvetch@joinforjustice.org. For more information, contact Tali Smookler by email or by phone at 617-350-9994 x 208.